It’s no secret I’m a fan of open air markets, I love trawling through every stand exploring what I can find. 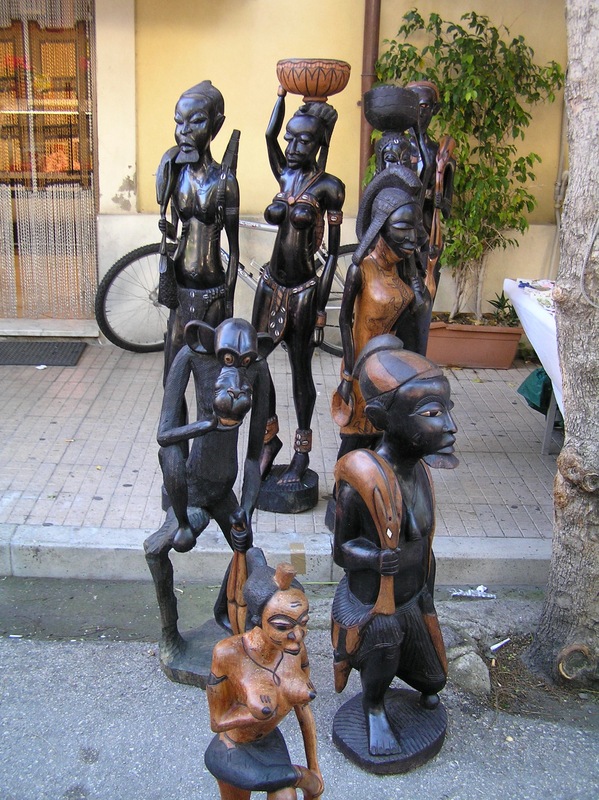 My blog is filled with photo’s of African wood carvings, crafty jewellery and fun discoveries, endless market randomness and textures. I enjoy the colours and the unexpected. 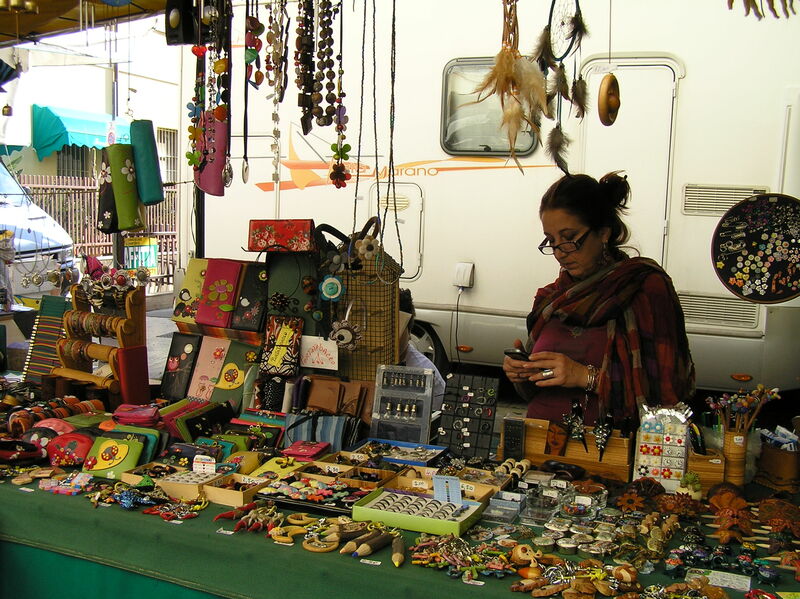 A Sicilian market contains everything from fresh produce, antiques, fabrics to bric-a-brac. Every year in Sicily, is made up of annual appointments with big Sicilian markets and fiere (/fiè·re/), which are big brothers to the simple daily food markets who bring together many vendors from other provinces together with the trade of livestock. A spring fiera previews what you will see in the stores during the summer, while an autumn one often brings a chance to find unique gifts without the Christmas rush. 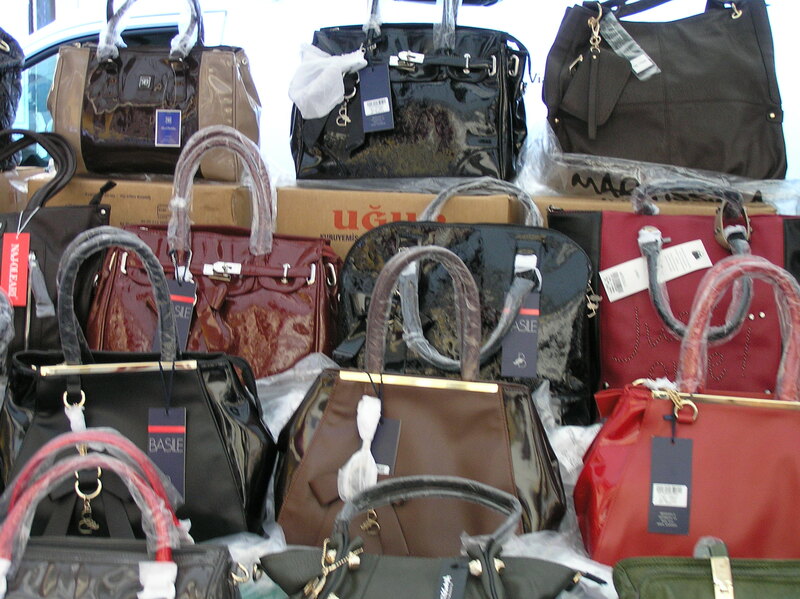 Often visitors to Sicily criticise markets as places filled with cheap Chinese rip offs, which sadly is a valid lament as over the years of the never ending economic crisis in Europe, many boutique operations and family businesses selling beautiful products have closed down, moving overseas to cut costs, leaving space for dreaded cheap imports to fill in the gaps. I’m afraid my beloved Sicilian markets are beginning to disappear. In my little piece of Sicily in Messina province most locals have an appointment with the Fiera at Capo d’Orlando on the 21st and 22nd of October which is associated with the feast day celebration of the local Madonna, who is the city’s patron. 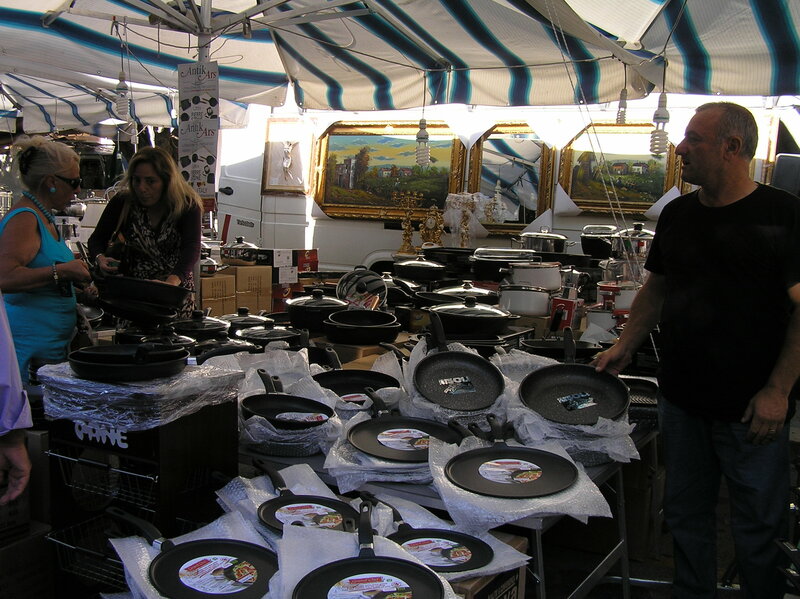 Also I never miss out on the autumn and spring markets at Sant’Agata di Militello, the ancient Fiera over the 14th and 15th of November (and the 14th/15th of April) which stretches out along the main esplanade running parallel to the Tyrrhenian sea. The November markets are usually where I do my Christmas shopping, but for the first time last year I actually came home empty handed. There were the usual endless stalls common of this extravagant fair, yet none of the substance of these historic markets which date back to the 1700’s. Established by the Ventimiglia family, a well known Sicilian aristocratic dynasty, who gathered up the agricultural wealth of the Nebrodi area, the Sant Agata fiera was a focal point for farmers and artisans of all types. The first day is dedicated to livestock while the second offers visitors everything from textiles to haberdashery, farming tools, local produce, fashion and crafts. Marching up and down the stalls last year I found nothing of quality, so much cheap Chinese junk, many obviously second hand clothes and shoes being passed off as new, strange one size fits all clothing which really won’t cover anyone who weighs more than 40 kilo’s and the same series of scarves and Christmas decorations as other years. I didn’t see the usual ceramics I go crazy over and there was only one antique stall which had the same things as last year, the owner sadly told me business is really slow and he probably won’t be back next year. 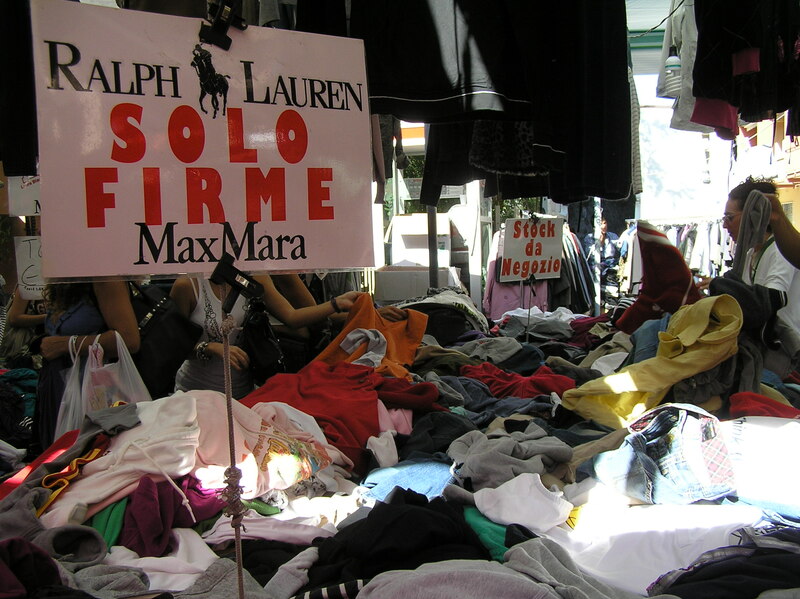 The decline of markets in Sicily has gradually been creeping forward all over the island. For example many travel magazines surprisingly still sing the praise of Palermo’s Vucciria as a thriving major Sicilian city market, but the once buzzing neighbourhood packed with hundreds of food stores spilling over out onto the streets has become nothing but a small strip of resilient store owners who keep the historic markets alive for the tourists. Italians believe in slow food and travel, where you take the time to soak in the character of a place, happily making the most of the moment. In a country where the people and culture are as colourful as the scenery itself, it is justifiable to seek out a more authentic connection to everyday life. 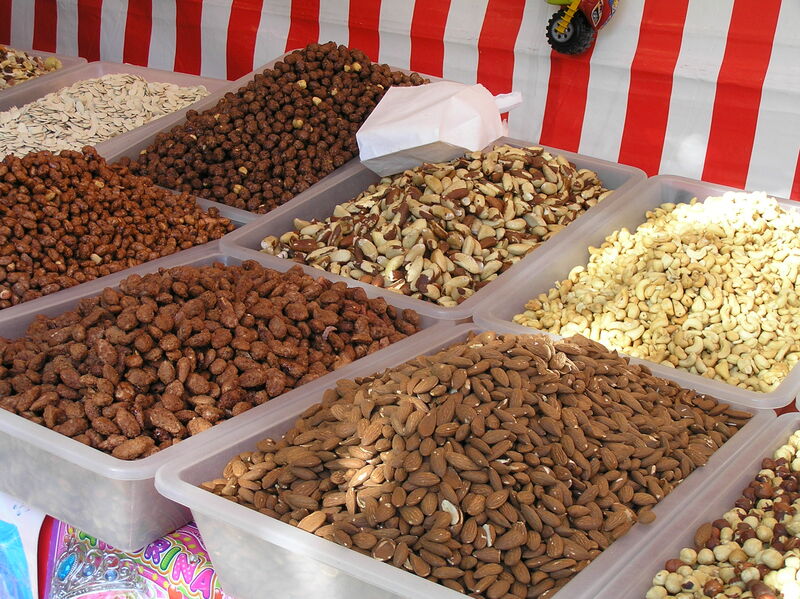 Food markets are filled with the sights, sounds and tastes of an Italy which relishes its food. In times of economic downturn Italians will cut back on everything else except what is on the table. Thank goodness the Palermitani’s demand for fine food persists, it is this which keeps the other daily food market neighbourhoods thriving. The il Capo, Ballero’ and Borgo Vecchio markets keep the traditions alive with their associated family run restaurants and street food vendors deep in the centre of Palermo. You can still have an authentic Sicilian market experience at Ballaró which extends from Piazza Ballarò in the Albergheria district (near the church of San Nicolò) along Via Ballarò past Piazza Carmine toward Corso Tukory, roughly parallel to Via Maqueda toward the main train station. While the Capo markets are tucked behind the Teatro Massimo opera theater and extend from Via Porta Carini off Via Volturno near the old city wall toward Piazza Beati Paoli. The Vucceria is at Piazza San Domenico, but in a much reduced manner as compared to its past history, it still winds along Via Maccheronai toward Piazza Caracciolo and Corso Vittorio Emanuele, branching off along Via Argenteria. The Borgo Vecchio markets are in between Piazza Sturzo and Piazza Ucciardone. Palermo’s markets are usually open all day from 9 to 7pm (they are closed Sundays and open only half days on Wednesdays). 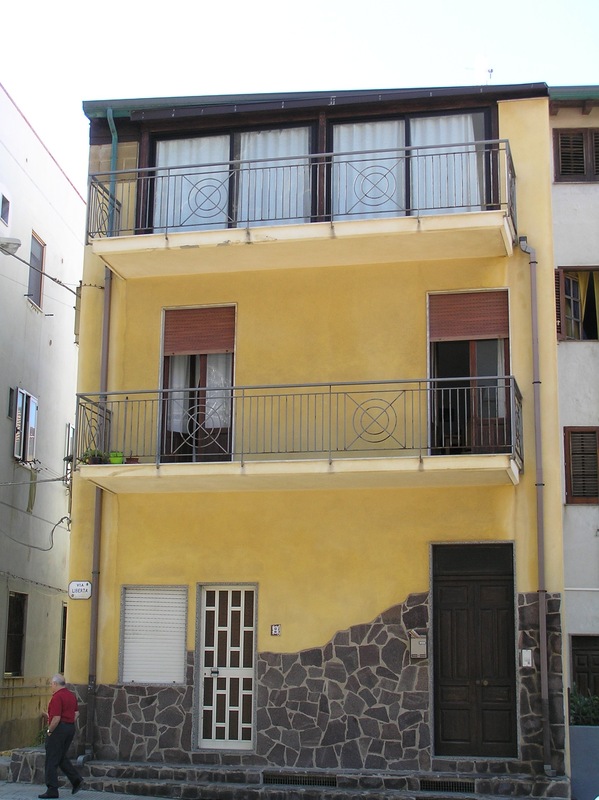 At Catania the main markets are in Piazza Carlo Alberto near Via Umberto and Corso Sicilia which is easily reached from Via Pacini off Via Etnea near the Villa Bellini park. The Pescheria (fish markets) filled with the city’s most sought after seafood is located off Piazza Duomo near the cathedral and fountain dell’Amenano, between Via Garibaldi and Via Pacini, extending along Via Gemelli Zappalà and some of the nearby streets. Catania’s markets are closed Sundays and afternoons. Sadly the markets around me seem to be fading into insignificance, so when you visit Sicily be sure to visit a major city’s food market as it is a precious piece of Sicilian history. To discover the best local daily markets in Sicily simply ask around, once you arrive in Sicily the best information will be found through local knowledge. 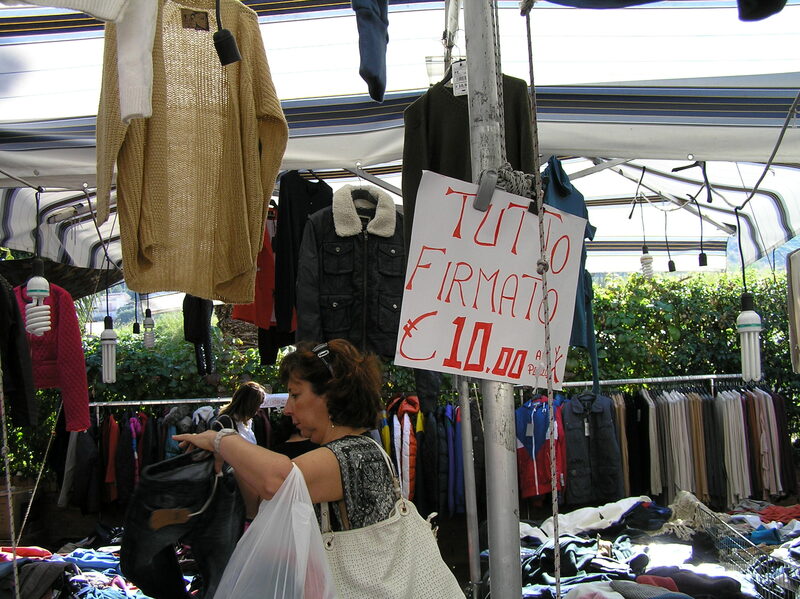 If you want a general idea about the different smaller markets to visit see the Italian Ambulente web page, which is a site set up by market stall owners to let tourists know about market days. The page is in Italian but it is easy to do a search of particular towns throughout Italy to see when the markets are usually on in most local squares. Here’s my personal list of Sicilian Food markets not to miss. Italy has an abundant amount of public holidays, ranging from the usual stuff like New Year’s day and padded out with things like Liberation Day (25th April), International workers day (1st May) and Republic Day (2nd June). Not to mention a fine cavalcade of religious celebrations including the Epiphany (6th January), All Saint’s Day (1st November) and the Immaculate conception (8th December). By far the most sacred of all holidays is the major Ferragosto summer vacation which Italians look forward to every year with a heightened level of fervent desire. The term Ferragosto is derived from the Latin expression Feriae Augusti (Augustus’ rest), which is a celebration introduced by the emperor Augustus in 18 BC. This was an addition to already extant ancient Roman festivals which fell in the same month, which celebrated the harvest and the end of a long period of intense agricultural labor. During these celebrations, horse races were held across the Empire, and beasts of burden (including oxen,donkeys and mules), were released from their work duties and decorated with flowers. Such ancient traditions are still alive today, reflected by the many Palio celebrations all around Italy, the most famous on the 16th August in Siena. Indeed the name “Palio” comes from the pallium, a piece of precious fabric which was the usual prize given to winners of the horse races in ancient Rome. 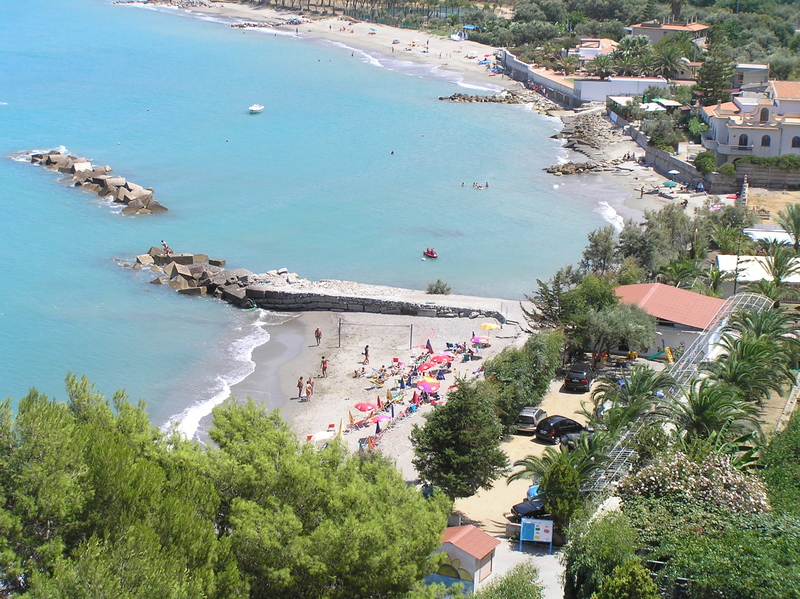 The popular tradition of taking a trip during Ferragosto came about during the Fascist period. In the second half of the 1920s, during the mid-August period, the regime organised hundreds of popular trips through the Fascist leisure and recreational organizations. People’s Trains for Ferragosto were available at discounted prices. My first summer alone in Italy I found myself stuck in Bologna in between projects, right in the midst of August holidays. I didn’t know anyone in this major Northern Italian city which becomes like a ghost town, every second store is closed and there is hardly anyone around. Bologna isn’t a touristy town so it wasn’t like being in Florence or Rome which are always filled with people all year round. It was a lonely place to be. August in Italy means the thermometer hits its peak and the humid Italo summer closes down the entire peninsular as all Italians go to the beach. In Sicily families who have migrated to the north of Italy traditionally come home to visit estranged parents and relatives and lie roasting on some Sicilian beach. With the Economic Crisis most are no longer making the trip, holidaying closer to home or not at all. The 15th of August itself is a religious feast day which celebrates the Assumption of the Virgin Mary, when the Catholic church believes the Madonna’s sinless soul and incorruptible body was taken up to heaven. In my small part of Sicily there are many ancient festivities in the cities where the ‘Virgin of the Assumption’ is the patron or protector, the day offers elaborate parades and celebrations from Randazzo to Messina, Capo d’orlando, Motta d’Affermo, Novara di Sicilia and Montagnareale. Sorry but all my links are in Italian but the images really give you a sense of the elaborate nature of the celebrations, Sicilian’s know how to put on a show! All Italian towns have their own saint which they call upon for help, nowadays it’s a quaint tradition and great excuse for a celebration but Patron Saints were an effective form of propaganda for the early church and brought in many new Catholics into the fold. 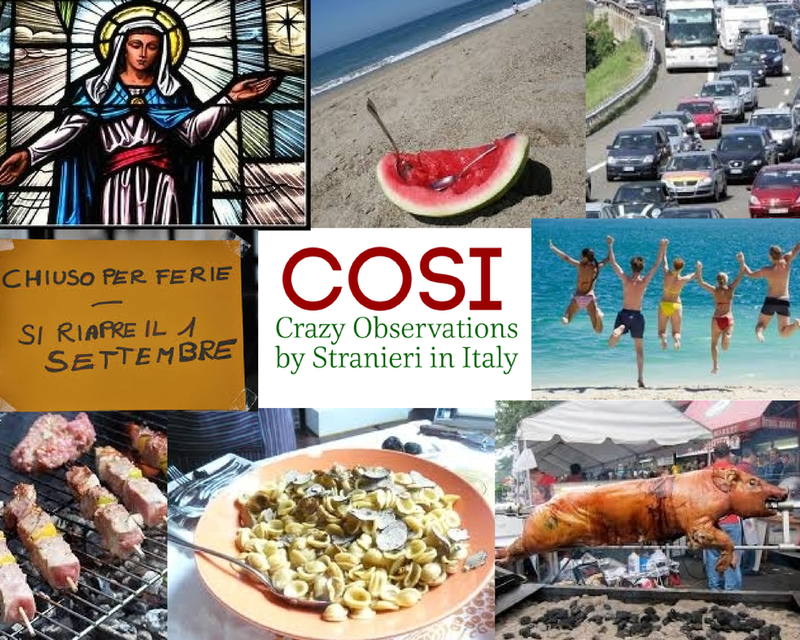 Sicilians like most Italians celebrate mezzo-agosto holiday with copious amounts of food, strange isn’t it ;-), either picnics in the mountains or bomb fire barbecues on the beach not to mention an endless array of food festivals or sagras which offer you taste of all things Sicilian. There is plenty of drunken action and I’ve witnessed many a heated argument over nothing, silly car manoeuvres and accidents. Don’t get me started on the mess that is left behind the next day! The whole nation strips down into vacation mode from suits to speedos and loud shirts, it seems ‘in ferie’ or on holidays gives people an excuse for bad behavior and worse fashion. Well I’ll probably will be guzzling beer, scoffing downing BBQ lamb while wearing a bikini which shows off my prosciutto thighs and flabby mummy tummy, trying to keep cool. November 8, 2013 .Reading time less than 1 minute. 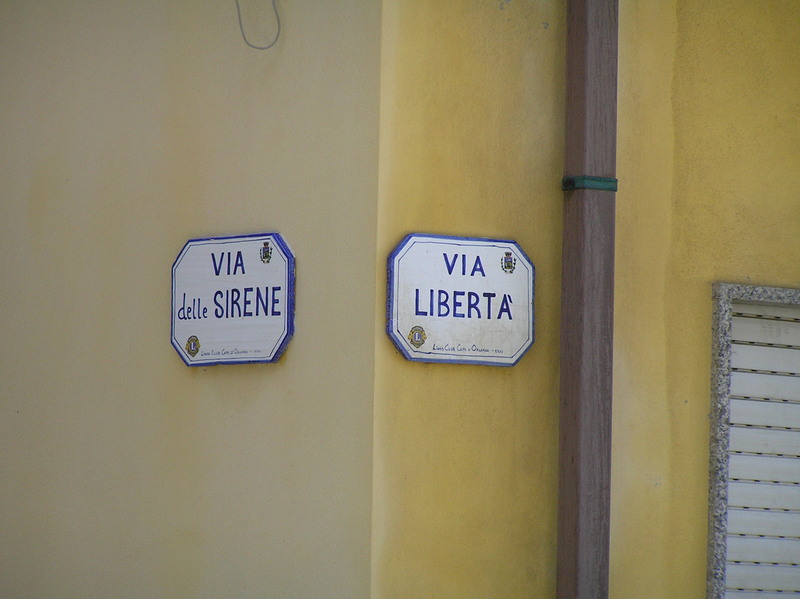 and Italian’s flare for street names. October 25, 2013 .Reading time less than 1 minute. Isn’t it funny how the beach and the sea gets better in the Autumn/Fall. Festa time at Capo D’orlando, Messina. October 24, 2013 .Reading time 4 minutes. It’s become a tradition at this time of year to attend a series of Festa’s or celebrations dedicated to patron saints that are common to most towns here in Sicily, not out of any particular religious desire but simply to have a day out, rummage through the endless stalls and perhaps start buying those pesky Christmas presents! I’m a sucker for an open air market, in all parts of Europe, whether it be an antique market in London, a fresh flower market in Rome or our weekly home town market for fresh fruit and vegetables I simply can’t get enough of them. The humble market is such a vibrant part of life here, filled with colour, confusion and the promise of discovering something unexpected and new. The trick is to go with an open adventurous spirit, don’t go and do something stupid like write a list because if you look down to read it you may miss out on spotting something wonderful. Some bickering, banter and wheeling and dealing is always the case at markets in general, as you negotiate the best price. There is always a bit of everything from household goods, haberdashery, textiles, hardware, CD’s, costume jewelry, clothes, shoes, helium balloons to attract the young and sweets to tempt the young at heart. The locals are here to renew their wardrobe, with clothing that looks expensive but really are discounted copies. It’s all about appearance baby, even in the financial crisis la la land that Italy has become, people still want to look good. I even found myself negotiating with an African friend, who pulled his ripped off designer bags out of a suitcase and onto a white sheet he put on the ground, for a Coco Chanel maxi bag, not bad for 15 Euro! I am attracted by the eclectic nature of each stall, some are just plain seedy, while others are exotic and filled with fashionable surprises. 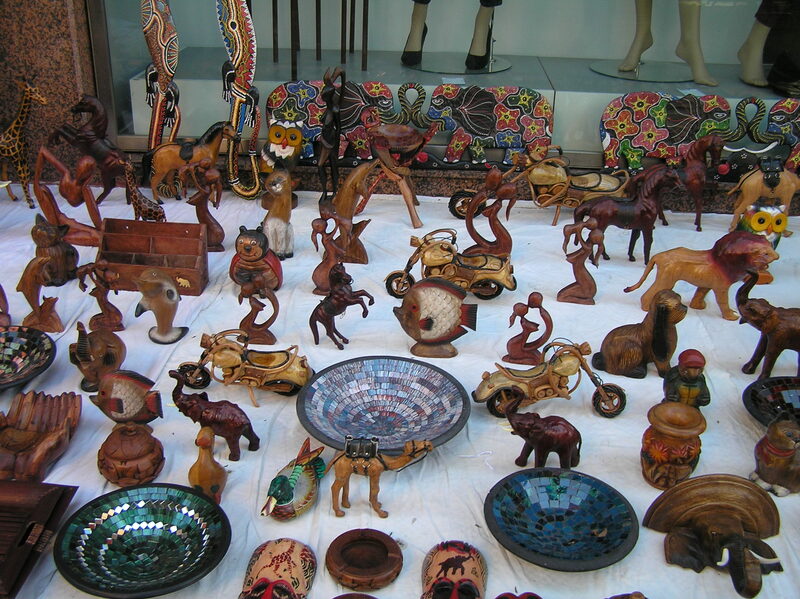 I’ve particularly fallen in love with African and Moroccan wood carving, but I haven’t had the courage to buy anything after I heard a story about someone who got termites from untreated wood. If I could be sure that the wood would be safe I’d love to get some smaller animal pieces for my son to play with or perhaps start a collection as every year they come up with different creations! That’s all from Capo D’orlando for this year’s Festa of the Madonna (22nd October), next month there is a festa in our adoptive home town Sinagra (4th November) and then a massive Fiera, which is a mega open air trade and animal market that takes over the town at Sant’Agata di Militello (14th/15th November), it is one of the oldest markets in Sicily, dating back to the 1700’s and brings together commerce from the provinces of Palermo, Catania, Messina and Enna. 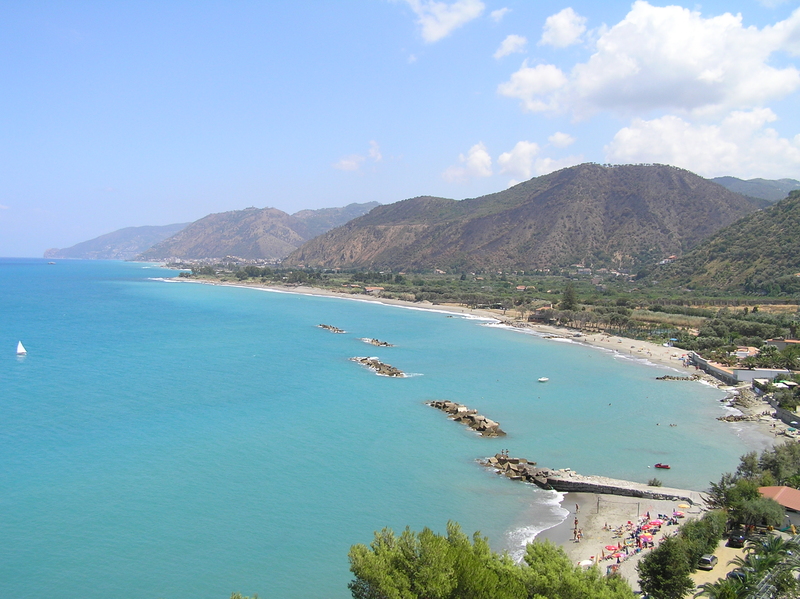 I recently looked over some old pictures I took one summer along the coastline in between Capo d’orlando and Brolo in the province of Messina, Sicily and I’ve suddenly had a yearning for the summer. 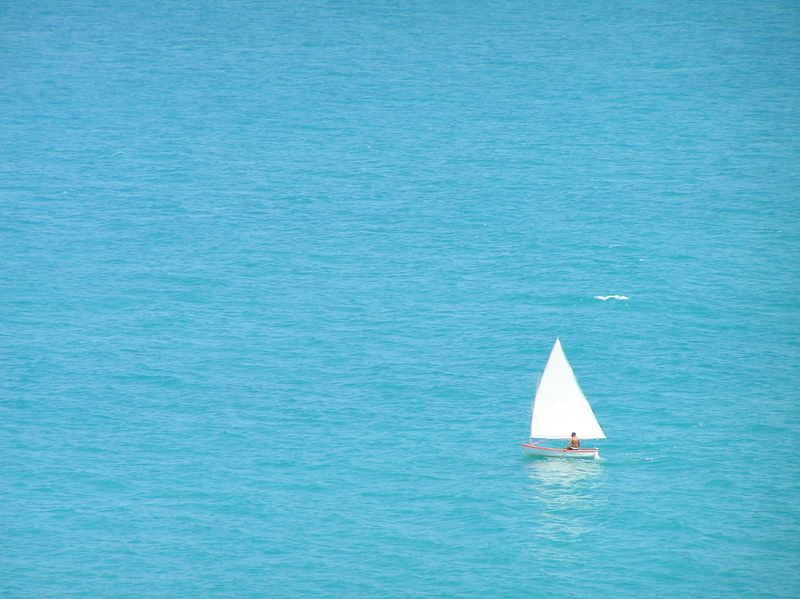 Look and see if you don’t feel the same desire to dive into the waters of summer in Sicily.